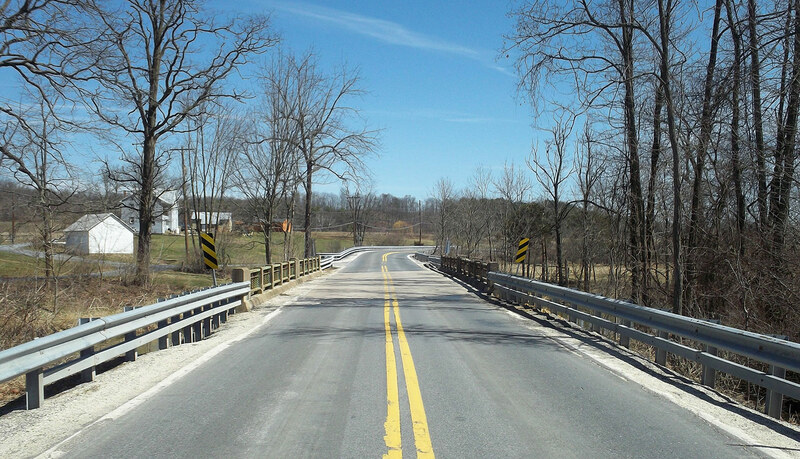 The bridge that carries Route 850 (Fort Robinson Road) over Bixler Run in Northeast Madison Township, Perry County, will close for two weeks, beginning June 18, for completion of the bridge replacement work that began last year as part of the Pennsylvania Department of Transportation's (PennDOT) Rapid Bridge Replacement Project. The main operation that requires the bridge closure is the application of an overlay to the bridge deck. When the bridge closes, drivers will be directed to follow a detour along Route 17 (Blain Road), Airport Road (State Route 3007) and Route 274 (Shermans Valley Road). Motorists may have noticed a slight bump as they drive across the bridge. When the bridge closes, a polyester polymer concrete (PPC) overlay will be applied to the deck, that will eliminate the bump. The PPC overlay is designed to protect the deck from the wear and tear brought about by Pennsylvania’s harsh winters and reduce the long-term maintenance costs. The polyester material can only be applied when temperatures are consistently above 40 degrees, dry weather is forecasted and after the bridge concrete has cured for at least 30 days. This bridge is referred to as JV-289 and is one out of the 558 bridges being replaced under the Rapid Bridge Replacement Project. JV references the joint-venture partnership between Walsh/Granite, which is leading construction for the entire project.